Titanfall is here on Xbox One, Xbox 360, and PC; shooter fans the world over are enjoying the game and all it has to offer. Like all multiplayer shooters, chatting with friends while playing is what makes it so fun. If you feel that the cheap headset you’ve been using, with its tinny sound doesn’t quite do it for you, then Turtle Beach has you covered. Today, we’ll be taking a look at their Titanfall Ear Force Atlas. Before splashing out $120 to buy it, surely you’d want to know how it performs? Is it just a basic headset with some Titanfall branding and a premium price tag, or does it deliver the quality sound which Turtle Beach is known for? You’ll have to keep reading to find out. Best of all, we purchased this Turtle Beach Titanfall Ear Force Atlas headset for our review, and we are now giving it away to one lucky reader! It could be you! Keep reading to find out how to enter for your chance to take it home for free. If you talk to any gamer, and you ask them about personal audio devices built specifically for consoles, Turtle Beach is almost assuredly the first brand that will come to mind. Ever since Turtle Beach released the Ear Force X1 headset, gamers have been jumping on the bandwagon. It’s not unjustified, because their products are certainly of high quality. The main drawback, however, is the high price tag, and the Titanfall Atlas Headset is no exception, retailing at $149 (but can be purchased at around $120 from Amazon). The price of Turtle Beach’s model is quite a bit higher than Microsoft’s official Xbox One stereo headset, which only costs $79.99. On the slightly more expensive side, we have the sleek-looking Polk Audio 4Shot with its retractable microphone, and is compatible with the Xbox One, smartphone and tablets — it costs $159. The biggest advantage the Titanfall Atlas headset has over these is the flexibility, with support for PC, iPhone, and consoles. 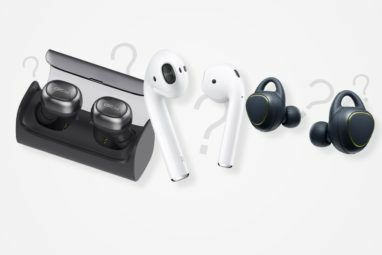 In fact, it can actually be the only pair of headphones you’ll need for your gaming and listening to music, which makes that $149 you’ll spend a little more sensible. But none of that really matters if it doesn’t sound good. So how does it fare in that regard? The packaging for this device is beautiful, featuring Titanfall artwork on the outside of the box. It’s clear that this is a model marketed squarely at fans of the game, and once you crack open the box, you will notice that the artwork on the headset itself also reflects the Titanfall style. As far as what’s packaged with headset, there are a few bundles of wires designed to allow you to hook the headset up to many systems. It also has an inline amplifier that is can be used on the PC and Xbox 360, but not the Xbox One. The recently-released adapter for the Xbox One controller is also included, for which you will need to download a firmware update that just takes a couple of minutes. Overall, while the slew of included cables is a little confusing, it comes with helpful guides you need to figure out the process of hooking everything up. If you are planning to use the Ear Force Atlas with an Xbox One or PC, the process is really easy. Using on the Xbox 360 is a little more complicated, and it differs depending on which the particular model you have. Still, it’s manageable, and the fact that it offers such a level of flexibility is really impressive. Buying multiple headsets for different devices isn’t ideal, and despite its Titanfall branding, the Turtle Beach Titanfall Ear Force Atlas Headset has you covered in that regard. Before we talk about comfort and the experience of using the Titanfall Ear Force Atlass is, we need to look at the hard numbers, because when it comes to headsets, the specifications will provide some insight on what to expect. Starting with the speakers (drivers), they are 50 millimeters in diameter with neodymium magnets. They have a frequency range of 20Hz-20kHz and a 16 ohm rating. These are not top-of-the-line in terms of actual numbers, but they are solid, and 50mm diameter drivers definitely deliver some pretty serious punch that you can hear and feel while you are playing. The microphone is omni-directional and bendable, so it can pick up your voice from wherever you decide to position it to suit your style. It has a 100Hz-10KHz range, and is also removable, so if you are using this headset with your smartphone to rock out to some music, you can simply disconnect the microphone. Since this is Titanfall-branded, and is probably why you will buy it in the first place, we need to start with how it looks. Personally, I find it to be absolutely beautiful. If you’ve never played Titanfall, the Atlas is one of the titans you can choose to use in the game, and the headset really matches the aesthetic of the titan itself. The color palette and fonts are an awesome match, and I can’t help but be a little impressed with how much thought Turtle Beach put into designing this headset. For a relatively large gaming headset, it’s surprisingly lightweight, which is great for extended gaming sessions. The removable microphone is a nice convenience, but it also looks quite good while attached. Now of course, there is nothing more subjective than how great something looks, so your opinion might differ. But Turtle Beach kept the design subtle but attractive. It’s a fairly neutral red, white, and blue color palette, so you don’t have to worry about wearing something too bright and crazy on your head. Even if you don’t necessarily love the look, it’s won’t make you stand out too much while you’re wearing it. The audio quality is good, but it certainly won’t blow you away. It’s not quite up to the level of sound we’re used to from the top-of-the-line Turtle Beach models on last-generation consoles. That is because there is no simulated surround sound on the Ear Force Atlas. So while the sound quality is nothing to complain about for a $120 headset, it’s not as full as it could be, and it doesn’t provide that immersive sound experience. You’ll definitely get good volume out of this headset, and if you crank it loud enough you can completely block the outside world and get immersed in the game. There’s no active noise canceling, but the design of the phones do a good job of blocking out the outside noise. Gamers generally play games to become lost in a world that isn’t our own, and this semi-closed headset does a great job of adding to that experience. The voice quality is fantastic. Chatting with the headset on, everyone I played with commented on how good I sounded, and when I let a friend borrow it so I could hear the chat audio quality for myself. Immediately, I understood why everyone was impressed, because it sounded quite a bit better than the basic chat headset that comes with the console or the Kinect. If you are using the Titanfall Ear Force Atlas with the Xbox One, all you need to do is plug in the Xbox One stereo adapter into the controller, plug the headset into that, and if you’ve already downloaded the firmware update, you are ready to go. The adapter has volume controls and buttons to change the mix between chat and game. The fact that you don’t need to run wires between the Xbox One and the headphones — like you need to do on the Xbox 360, or use an inline amplifier like on the PC — makes using the Ear Force Atlas a downright fantastic experience and one that even the most casual tech user can figure out in a heartbeat. When using it with the Xbox 360, the process is a little more work. The one complaint I have here is that certain Xbox 360 models require a separate adapter in order to work, and it’s not included in the box, which means an additional purchase is required. Still, once you have it, the instructions do a good job of explaining how to hook it up, just be prepared to have a set up that isn’t as pretty and clean as hooking it up to the Xbox One. If the 360 is going to be your primary console for using this headset, you might consider spending a bit more to get a wireless model if you don’t want to trip over wires. As for PCs, use the amplifier, plug it into a USB and audio port on your gaming desktop, and you are ready to go. It works quite well on PC, and it’s not much harder to use than an Xbox One. For portable gaming systems and smartphones, no adapters are needed. Simply plug the audio cable that is attached to the headset into the device, just like any ordinary pair of headphones. In the end, this headset is incredibly easy to use with all consoles. Even though it’s not something that’s advertised by Turtle Beach, you can even use these with a PS4 since any device with a 3.5mm jack is supported, so you can use the same technique you would to plug it into a mobile device with Sony’s new gaming system. When you think about the amount of versatility offered here, it’s worth the money. Turtle Beach has designed a very comfortable headset that can be worn for long periods of time, which is critical for gamers who play for hours on end. They aren’t perfect though, and I found that they squeezed the sides of my head a little for the first few hours of usage, but I do have a relatively large head. They did stretch out after a while which reduced the pressure, but it’s something to keep in mind. The ear cups are fantastic — they are soft, and I really don’t have any complaints about them. They sit on the ears, and are generally very comfortable but could leave your ears sore after a long gaming session. To put it simply, Turtle Beach has clearly used all of its experience in designing headphones for gamers into this. They know how to make a comfortable pair of headphones, and the Ear Force Atlas reflects that. 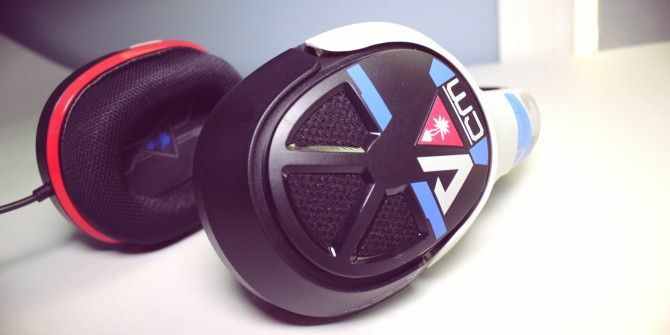 All in all, I quite like the Turtle Beach Titanfall Ear Force Atlas headset. It’s not perfect, and it lacks the simulated surround sound of many top-of-the-line models, but it does still have stellar sound quality. It’s comfortable enough for long gaming sessions, and voice quality gets the job done perfectly. It’s easy to use on most systems, but can be a bit of a pain to get set up on the Xbox 360. The flexibility is its main selling point, and it can be used with just about any gaming console, mobile phone, or PC. For $120, you could certainly do worse, though, if you aren’t a fan of Titanfall, all of the branding will probably be a turn off for you. Congratulations, Melissa Douglass! You would have received an email from jackson@makeuseof.com. Please respond before May 23 to claim your prize. Enquires beyond this date will not be entertained. I use my phone earbuds. Turtle Beach Titanfall Ear Force Atlas. They look so cool! Logitech PRO at the moment. I guess I should say Turtle Beach!? I recently picked up a Mad Catz headset and it seems comfortable and all... yet I have never truly played with a headset, so I have nothing to compare it to ... other than no headsets and speakers blasting out the awesome sound!! ATH M150's are my favorite at the moment. I dont use Headsets by i would really love to use this headphone!! What's my favorite gaming headset? I don't do the gaming thing. So, I've no favorite. That said, the review of this one seemed pretty thorough. Turtle Beach Titanfall Ear Force Atlas! Didn't have one then. But from what i have heard, logitech seems fit for it. Don't have a favorite. The Turtle Beach can be if I win it though. I don't have a favorite gaming headset. I have a nice Fatal1ty headset that I love, but this Turtle Beach Titalfall one is great too. Never had any. This would be great. I never use gaming headset because I don't have one. Do not have any so far. I like sony headset but logitec is not too bad. I haven't ever owned gaming headphones so I dont have a favorite. I've never used one before, so this would be my favorite the day I win it! I dont know that I really have one but I'd love to give this one a try. I had an older turtlebeach set that were stolen when my house got robbed. I prefer the Logitech headset. Don't have one! Been using a Sony HMZ-3TW home theatre headset - brings a whole new dimension to gaming - truly immersive. Great headphones with it, too; deepest bass I've ever heard from earbuds! I don't own a gaming headset. I just use a normal headset from Logitech. I haven't got any. Would be nice though. Haven't used one so far. Hopefully this will be the first!!! I have the logitech G430. They are comfortable and have the same sound quality as my old TB P-11 but the surround isn't the best. I don't own a gaming headset, but I guess I'll use this as the chance to check one out. I try some steelseries and razer, but I do love most is razer kraken. I got a set of green Kraken Pros from Razer while they were pushing them. Won a pair of blacks (same thing) soon after. They went with the 7.1s & metal versions as well as white, amusingly. I think you need to fix the issue with YouTube Videos. I use Chrome and I always get stuck up at this slide - no matter how many times I watch the whole video, it does not go to next slide. Please take it serious. Or else, just remove it completely. Thanks. This one if you give it to me. I really don't have a favorite pair. There is so many out there, it would be difficult to choose just one. I just use my Sennheiser headphones, as don't really have much need for a mic at the mo. Turtle Beach headsets rock! We have owned several sets, having to purchase new ones only because a pet destroyed one pair and a friend of my sons ruined the other. My favorite gaming headset is my Turtle Beach PX3's. They work on PC, Xbox 360, and PS3s. They work great and I love them except I had to tape something that broke. I play Titanfall, which is one reason for wanting this headset, and the other is I need a new, better, not-broken gaming headset. At present I don't own a pair. What ever I can afford at the time. The Titanfall Ear Force Atlas. I don't really have a favorite, but this one looks pretty good. I would definitely consider this one. My Astro A50 is pretty sweet. I have been using the Logitech G930 for years now so that's my pick. CM Storm so far. I would love to try these though! I've only used a Sennheiser, but heard good things about Astros. I do not own a gaming headset! I haven't owned many, but I'm really enjoying Corsair's headsets - so far I've been able to keep them on for really extended periods of time without my ears hurting. I have a pair of JL over heads that I use for my games. I don't really have a pair of favorite headphones but i am very pleased with a sony headset running on 4 years now. Steady build, decent sound and quite comfortable for long sessions of listening or gaming. Ain't got any yet! Want these. Look damn good. Logitech G430 Gaming Headset is my favorite for the moment. I dont have a specific headset for gaming! Currently I do not have a favorite gaming headset. I've got the Logitech G930. I really like it, but I haven't had the issues with it that other people have, ie wireless connection cutting out. This would be my favorite if i won!